Oh, come the hell on. 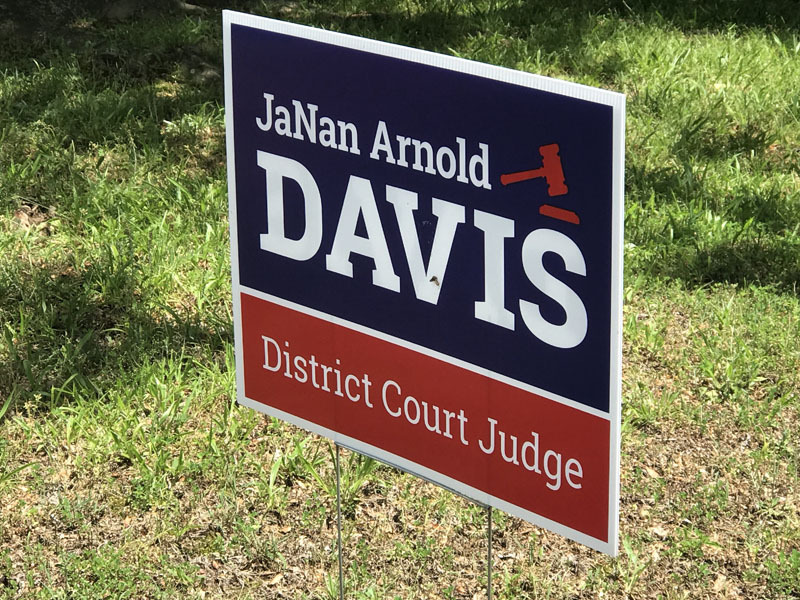 Last week, we did two posts about Little Rock District Court Judge candidate JaNan Arnold Davis’s problems when it comes to properly filing campaign-finance reports and (more importantly) when it comes to just following the law for judicial campaigns. Today, as I was driving to pick up my daughter from school, I happened to drive past one of Davis’s yard signs. Immediately, something seemed off. It had less text than you’d expect. So I circled the block and went back to look more closely. That’s right — the sign does not have the standard “Paid for by” language that you see on pretty much all campaign signs, mailers, and other advertisements. Campaign signs, campaign literature, and other printed campaign materials under this section shall clearly contain the words “Paid for by” followed by the name of the candidate, committee, or person who paid for the campaign sign, campaign literature, or other printed campaign materials. Would this be a big deal on its own? Probably not. 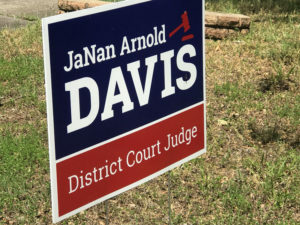 But this is not an isolated incident; it is another part of the same pattern of Davis either being unaware or simply choosing to ignore very basic laws that all candidates know and follow. At the risk of beating a dead horse, this is a person who is running for a judgeship while showing, repeatedly, that she cannot or will not follow the law. Prohibited to cell phones, pagers, or other mobile devices without the called party’s prior express consent. the identity of the business, individual, or other entity initiating the call (and if a business or corporate entity, the entity’s official business name) must be stated clearly at the beginning of the message; and the telephone number of the calling party must be provided either during or after the message. The “prior express consent” required under the TCPA is fact-specific, but it generally requires that the person receiving the call had previously communicated to the campaign, either orally or in writing, that he consented to receiving such calls. The person who sent me the recording said that he had not provided any such express consent, as he had not had any contact with the Davis campaign until this call was received. Additionally, if you listen to the recording, you’ll notice that nowhere during or after the call does it state the telephone number of the calling party. 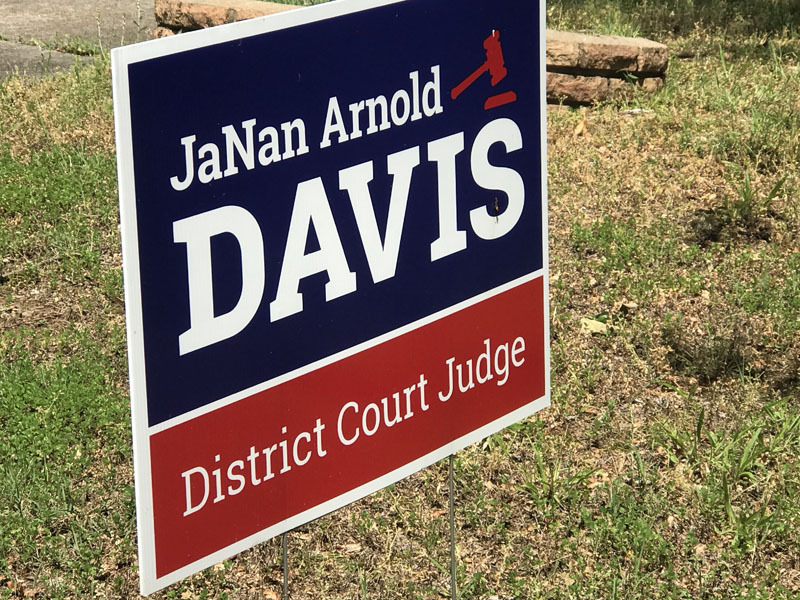 In addition to being further evidence of a pattern of ignoring laws, robocalls such as this could wind up costing Davis financially. The TCPA creates a private cause of action, in which the person who received the call can sue for either actual damages or statutory damages from $500 to $1500 per call. The FCC can also issue fines of up to $16,000 per call. There are other candidates in this race, of course, and no candidate is likely to be perfect across the board. But where one candidate has violated at least five different election-related rules, while the others have not, that is absolutely something that voters should consider when deciding who to elect as a judge.